Welcome to The Gadget Professor Show #324 hosted by Don Baine. MULTIFUNCTION – 2.4GHz Mini Wireless QWERTY keyboard, Touchpad combo, Upgraded LED backlit, multimedia control keys and PC gaming control keys with USB interface adapter. 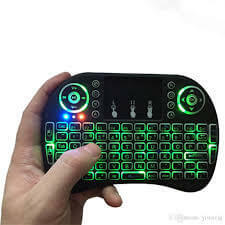 PERFECT COMBO – 92 keys Wireless QWERTY Keyboard, Touchpad which supports multi-finger functions, A single finger click as left mouse function, two-finger click as the right mouse function, double finger drag as the rolling screen. INNOVATIVE DESIGN – Built-in high sensitive smart touchpad with 360-degree flip design. Innovative shape, portable, elegant. The Ergonomically handheld design is easy to carry and operate. WIDE COMPATIBILITY – Perfect for PC, Pad, Android TV Box, Google TV Box, Xbox 360, PS3, HTPC, IPTV. Compatible with Amazon Fire TV (Not Amazon Fire TV Stick). ENERGY-EFFICIENT – Auto sleep and auto wake mode. After 3 minutes without any operating will into sleep mode, press any key about 1s to wake up. Build-in rechargeable Li-ion battery that has longer standby time. EASY TO USE – No need to install software, with the USB Receiver at the back of the keyboard, plug and play, suitable for input text, browse the internet and play games.